I needed to make up a directions sheet for this anyway, so I figured I would create an easy-reference page also. 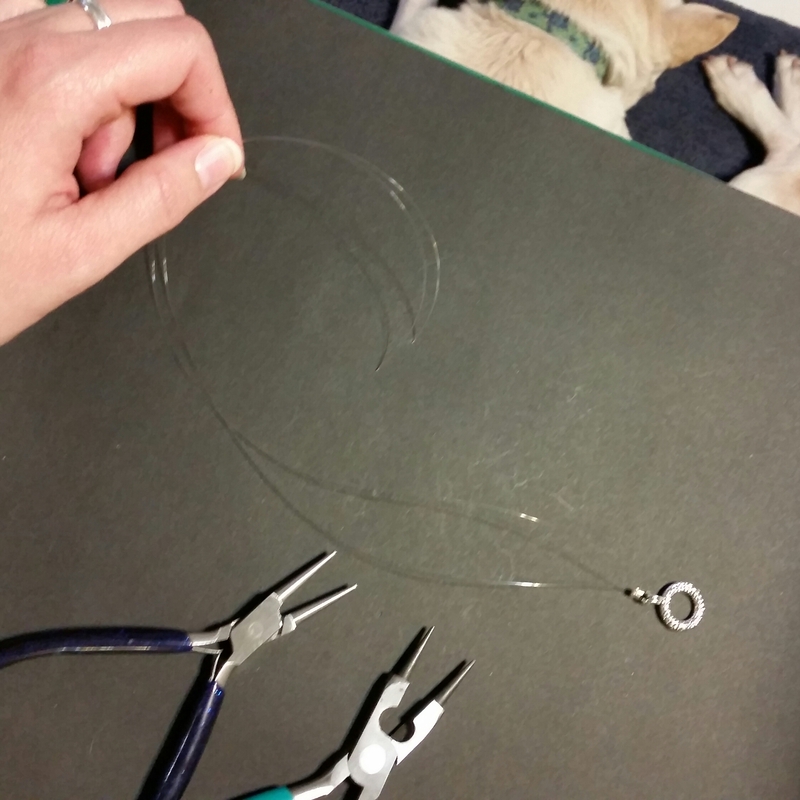 First up are the directions on making one of the more basic, stretchy ones like the one I learned to make while inpatient (originally described in this post about grounding objects). beads of your choice (I used glass beads but you can use any beads you like. It’s a good idea to pick textures, colors, & materials that are soothing to you. I like soft things for the most part, so my beads were smooth or “soft” in texture. I picked a variety of shapes to give my fingers varied stimulation as I moved them through my hands. I picked my focal bead with a few bumps on it to give me something different in case I needed it). tie a temporary knot at one end and string your beads (can also loop the string back through the bead so it stays in place while you add the others). Make sure you do not string them too tight because it will make the next step difficult. I used a larger bead at the loose end to help keep it in place when not in use (doesn’t slide out as easily. It is also a nice “focal bead” to fiddle with – slightly bumpy in texture for when I want to feel something a little more rough). I used a variety of shapes and colors, but kept to colors I find soothing. Some of the beads used to have a sand-blasted texture, but that has since worn off from too much fiddling. To wear, simply slide the loop over your wrist, wrap the long portion around a second time, then tuck a length of it underneath the closed-loop portion of the bracelet. I found mine slips loose if I only tuck it under once, so I loop it back onto itself again and tuck under a second time. cut a length of string long enough to fold in half, then wrap twice around your wrist plus about 3 inches/~7cm (I measure out a piece about the length of one arm from fingertips to shoulder. This gives me enough to comfortably bead the bracelet and attach the end without having too little string to hold onto). string a wire guard on and place it in the center. sting the “O” side of the toggle and slip it onto the wire guard. fold the string in half to get a double-strand to bead on (with the toggle and wire guard making up one end, and the two “ends” of the string being the other). string a crimp tube with the double strand and pull it down to the wire guard. Flatten the crimp tube close to the wire guard, but leave a bit of space so you don’t put too much stress on the string. enclose the flattened crimp tube in the crimp bead cover. close the crimp bead cover around the flattened tube to hide it. sting your beads onto the double string. you will need enough to wrap around your wrist twice plus a little bit (so the bracelet isn’t too tight on your wrist after you pull it through the toggle. 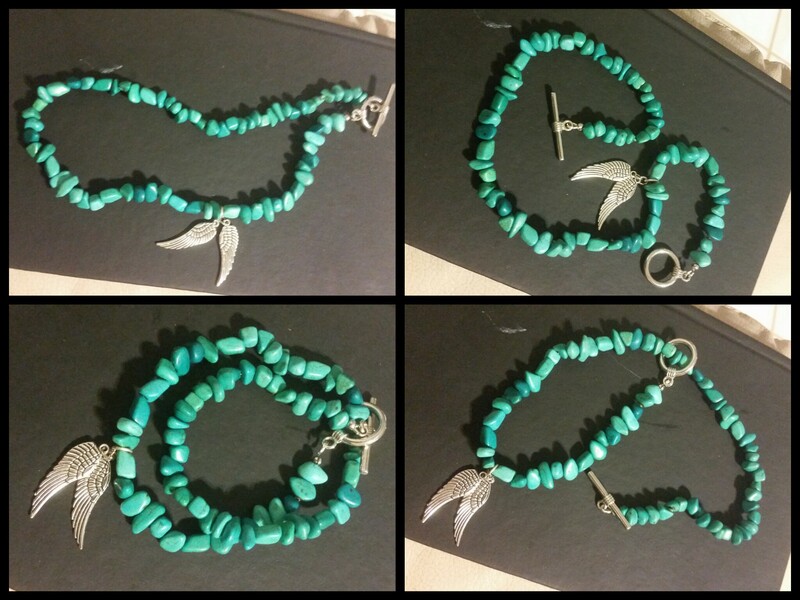 I make mine with an average of 14 inches/~29cm of beads without counting the length added by the clasp). 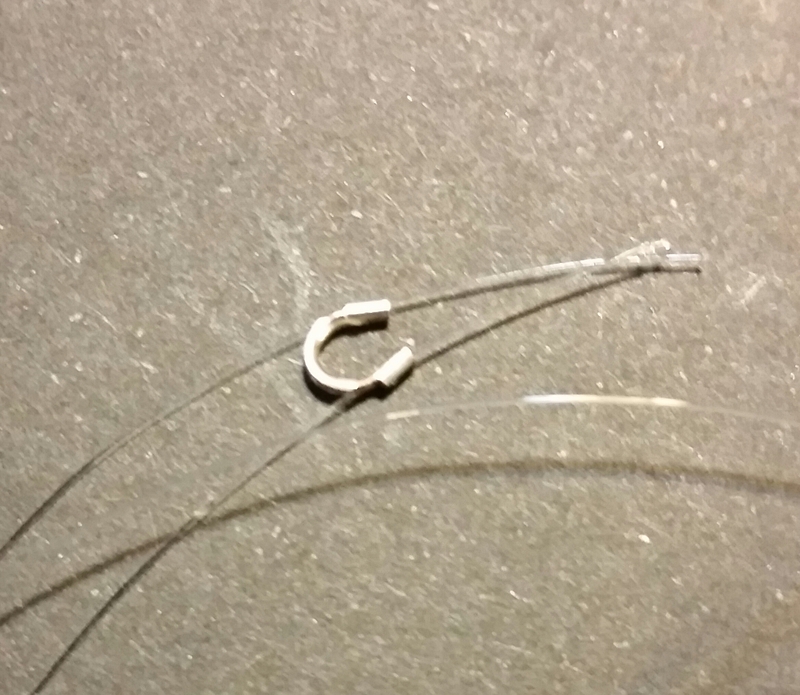 string on your wire guard with both ends of the string going through as one piece. string on the other part of the toggle and settle it into the wire guard. weave the end of your string back through the crimp tube and one or two of your beads. pull the string taut, but make sure there’s enough “give” that the beads can shift a bit. 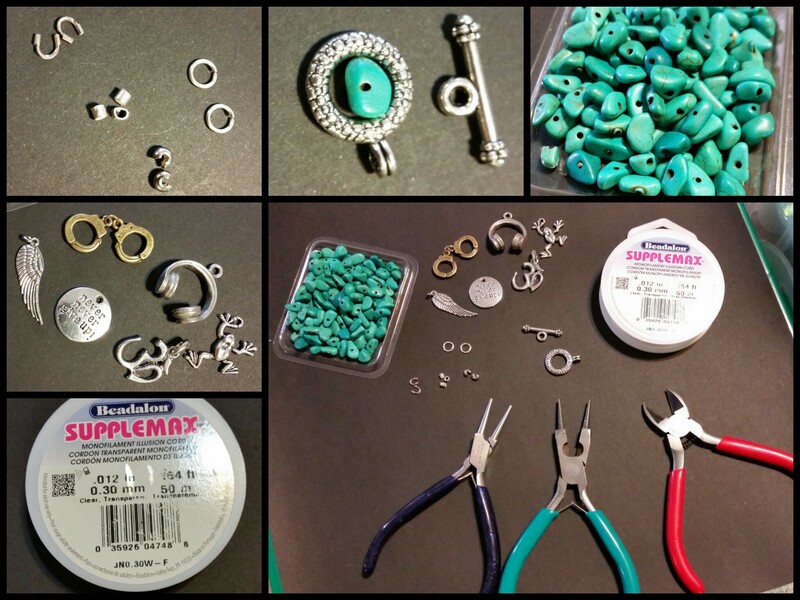 flatten the crimp tube between your beads and wire guard. attach crimp bead cover like you did the first one. wrap the bracelet around your wrist like you would if you were putting it on. Make note of where the “center” is on top of your wrist (on the part of the bracelet that’s closest to the “O” side of the toggle. If you put it on the other end, you will not be able to pull it through the toggle and it won’t work as a grounding bracelet). 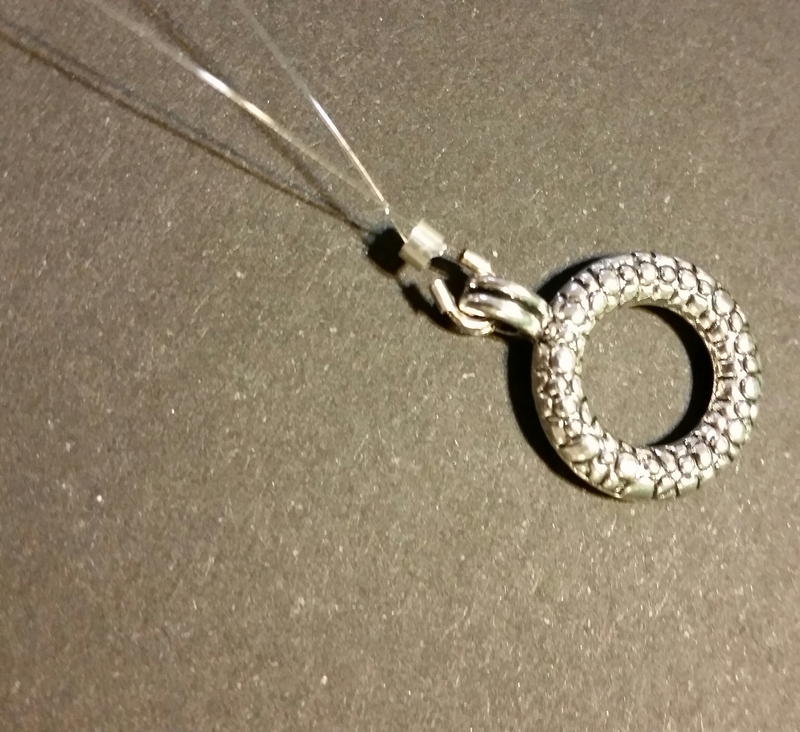 Attach one jump ring to the other, then secure one of them to the string (between 2 beads). Finally, attach your decorative charm to the second jump ring. Let me know if any of the directions are confusing or unclear, I will try to do my best to explain it better. Hope the pictures help. 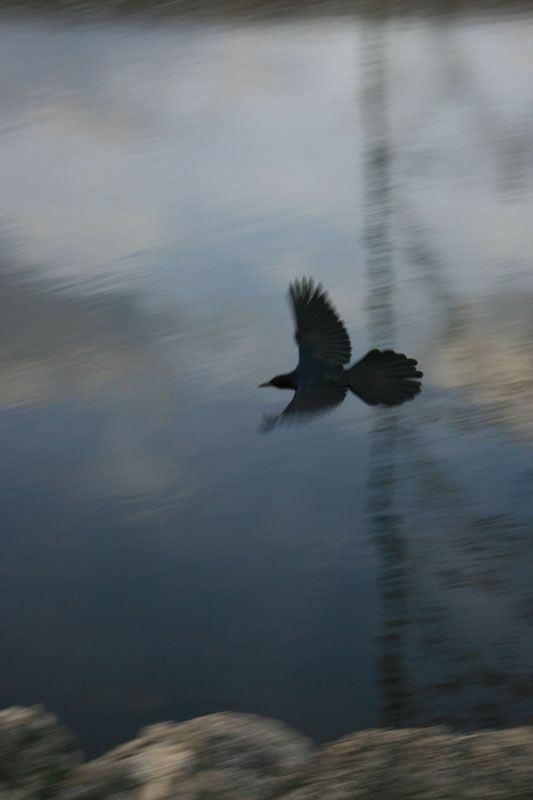 Sorry some are blurry, and there are not that many. 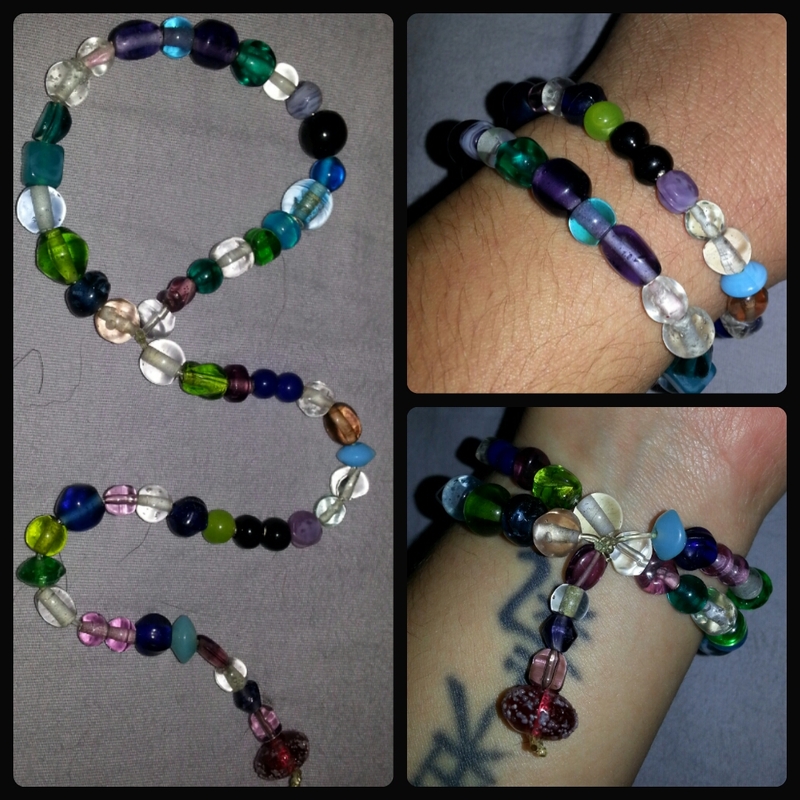 I took pics with the left-over supplies after I had finished making the bracelets for the week.